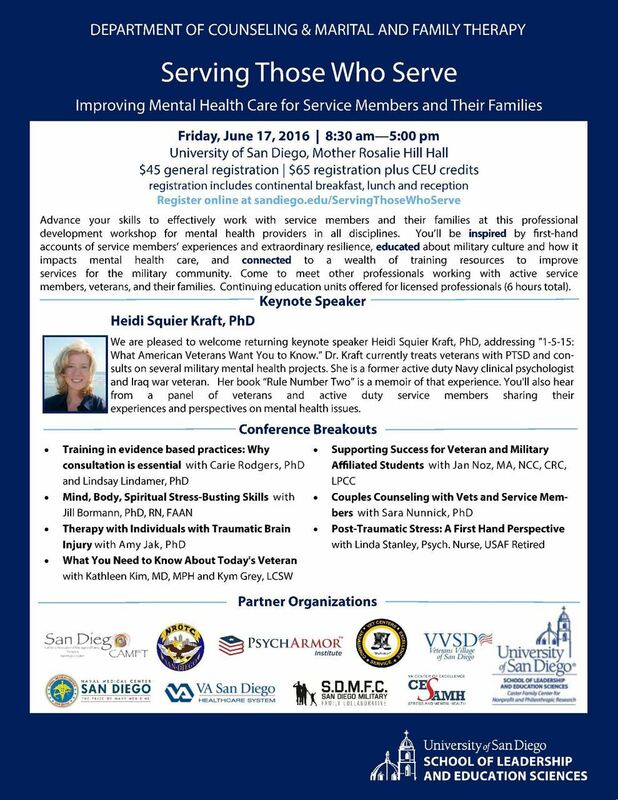 Advance your skills to effectively work with service members and their families at this professional development workshop for mental health providers of all disciplines. You'll be inspired by first-hand accounts of service members' experiences and extraordinary resilience, educated about military culture and how it impacts mental health care, and connected to a wealth of training resources to improve services for the military community. Come to meet other professionals working with active service member, veterans, and their families. This professional development workshop is for mental health providers and trainees across disciplines. Six continuing credits available to LPCC Counselors, MFTs, Psychologists, and LCSWs. Dr. Heidi Squier Kraft will return as our keynote speaker, addressing "1-5-15: What American Veterans Want You to Know." You'll also hear from a panel of veterans and active duty service members sharing their experiences and perspectives on mental health issues.